Because it seems to me, most of the people of a certain age know full well where they were when they heard about the tragedy that occurred on September 11, 2001. In our area especially, we know of families who lost loved ones, who endured unspeakable tragedy and who witnessed the atrocities associated with that day. They are ever emblazoned on many hearts, minds and souls. There is also another side to the tragedy when we try to look at the light of compassion, of helpfulness, of unity that occurred through that experience. Strangers helping strangers. People going beyond their limits to save someone else. All of the unmistakable soulful connections that came from the irrevocable losses that occurred from the tragedy. Remembering those whom we lost as the bells toll in NYC today, the names read of those souls who were unable to return home to their loved ones that day. The unfurling of our flag at the Pentagon Memorial in Arlington, VA. The tears that many of us still shed on this day, even so many years later. There’s a heaviness in the air today as the skies weep rain. Those whom we lost are never forgotten. Those heroes who gave their lives to help others. Their angelic light continues to remain in the memories of our hearts. Let us take a moment of silence with love in our hearts. 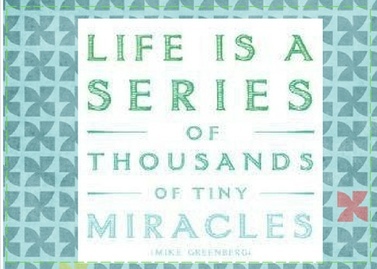 Life is a Series of Thousands of Tiny Miracles ~ Mike G.
I have been on an incredible journey the last 2 weeks which without sharing too much, I will tell you that I am having an amazing surgery on May 9th in NYC which is going to be executed by 2 pioneers of this procedure which will change my life forever, for the better. To tell you that I am so very grateful for the journey that has easily led me here is an understatement. I have repeatedly cried tears of gratitude over the past 2 weeks as I am so very blessed to be given this rare opportunity to change my life and my body for the better. As a breast cancer survivor, I have endured many surgeries, chemotherapy and radiation. In the past 10 years alone, I have endured 6 surgeries. I have lived with a numbing pain that never leaves me and is such a part of my life that quite honestly, I can’t remember what it’s like to not be in pain. To have the gift of the opportunity to remove the implants which have plagued me for 10 years and are causing me increased pain and complications even after having them already replaced once to no avail is such a blessing to me that it makes me tear up even as I write this to you. I couldn’t have orchestrated the timing, the help, the benevolence, the serendipity of all of the amazing coincidences which seems to miraculously appear and make my life and my decision easier. I know that I am meant to have this surgery right now as all the planning in the world couldn’t have lined up my stars, my appointments, my angelic helpers and the blessings that have rained down on me like cherry blossom petals in the wind. I have all that I need for this long surgery and recovery ahead. Strangers have helped me in inexplicable ways and doors have opened for me faster than I could have exclaimed ‘open sesame’ which I just continue to find so amazing. I just keep going with the flow and I’m not worrying! keep manifesting and keep your faith. waiting for you when you’re ready. a peace overcomes you and you just know. May All be right in your world today too!